About Death presents a gentle, yet unsentimental, story about how a family deals with the death of their beloved dog. From the pages of uu&me!, a popular magazine for Unitarian Universalist children, comes the first in a series of small books about big topics. A sensitive and honest story of the death of a family dog, followed by a series of questions a child might ask about death and its aftermath answered in direct simple language. 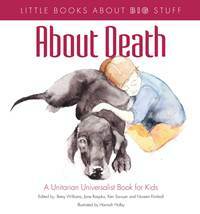 About Death presents a gentle, yet unsentimental, story about how a family deals with the death of their beloved dog. The story is followed by a series of questions a child might pose about death and its aftermath, particularly the rituals and cultural customs that accompany the death of a person. The answers to these questions, like the story that proceeds them, are frank and respectful of the child's curiosity. At the same time, both the story and the questions are illustrated by lovely watercolors that say, without words, yes, death makes us sad. A short poem that follows reminds us that death is a part of life.